Little One Books is a great company that helps you find quality books for children 0 - 5. They have a team of professionals that have personally reviewed and selected each item in their online store. Joan McCoy and Barney Cohen, grandparents of 5 children under the age of 6, started Little One Books after being overwhelmed by the number of products available. They want to help others make informed choices among the vast amount of material you can find today. When you go to Little One Books you can shop by the age of the child. There you will find books, video, or music. 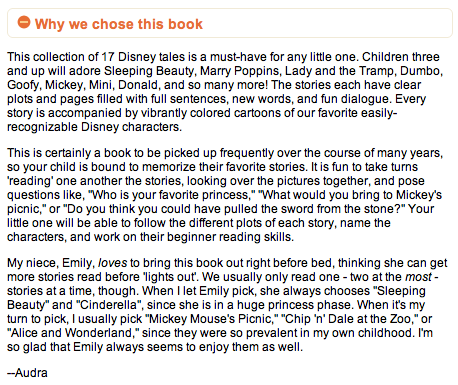 For each item you can see "Why we chose this book" for a great and personal review! When millions of books are available it's nice to have a company that helps us to narrow down the selection and help us out. The review actually sold me. I really want my daughter to enjoy books, especially since I didn't as a kid. I thought this would be a wise book to have in my collection. I would love it if she looked more forward to me reading her these stories than watching the movies. 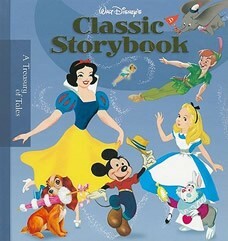 :) :) This book is beautiful! My daughter can't take her hands off of it! My husband was even happy with the selection of "old school" stories in it. There is a special offer going on right now. 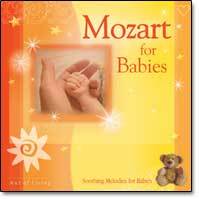 When you buy ANY two items you'll get a FREE Mozart for Babies CD! Use code mozart at checkout. Little One Books is giving away a $15 Gift Certificate to their store!! The certificate will be mailed to the winner. 1. Sign up for Little One Books Newsletter - You will get the news on the latest in child development. Newsletter sign up is at the top right. Giveaway will end Tuesday February 15th at 10 p.m. MST. Winner will be chosen by Random.org. I was given the above book for review, no other compensation was received. All opinions are my own. All information gathered for the giveaway will be discarded when over. Your privacy is important. New follower from Utah! Check me out and would LOVE a follower back! Ooh...I think I may have entered this twice! Sorry! No problem Kimberly, thanks for letting me know! Good luck! !